Looked where I thought it might be but no joy! 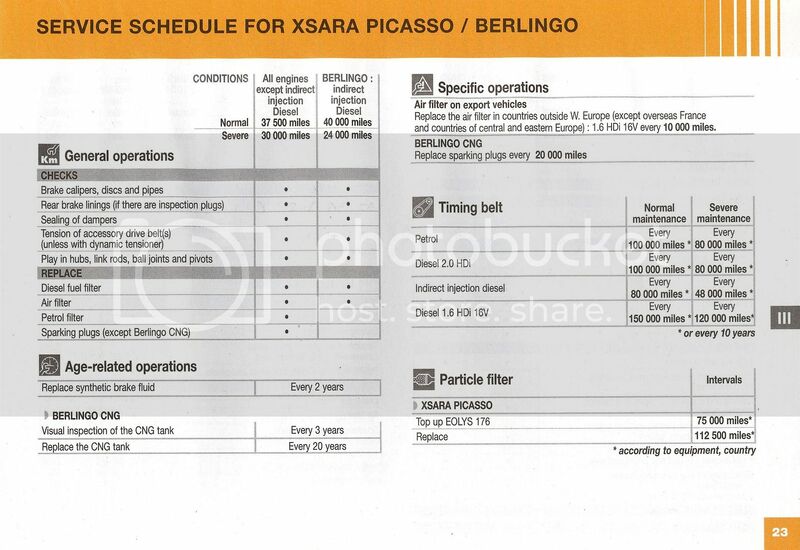 Does anyone have a copy/access to the service schedule for the 1.6 HDi Berlingo 2007? Here, in the Spanish countryside, it is a real pain sometimes to get a 'proper' service done. I'm more than able to do it myself but it would be handy to know what is carried out by Citroen. Oil changes, filters are given but there may be the odd thing I miss. Thanks for your reply. I managed to locate my Spanish version of the attached but now I have it in English I'm less likely to get confused! I have spent most of the morning trying to locate a service manual for the 2007 1.6 Hdi. Usual download sites but only in French for the 2007 model. Haynes do not appear to produce an up to date manual for the Berlingo. Did download one manual (and paid for it) which appears to be an on line service manual for Citroen agents. Not very appropriate as loads of technical stuff but not good on basic 'how to' stuff. I recently changed the oil filter (it has the paper cartridge replacement type) and was a bit concerned as to the positioning of it as the filter had an O ring locator plug. After a bit manoeuvring I noted that it could only really go in one way (the O ringed plug located into a tube in the bottom of the filter housing) but it would have been nice to have this confirmed with a diagram! Anyhow, it works, no funny noises or alarm bells/lights! I also wish to start servicing my similar van but the handbook is a bit basic. 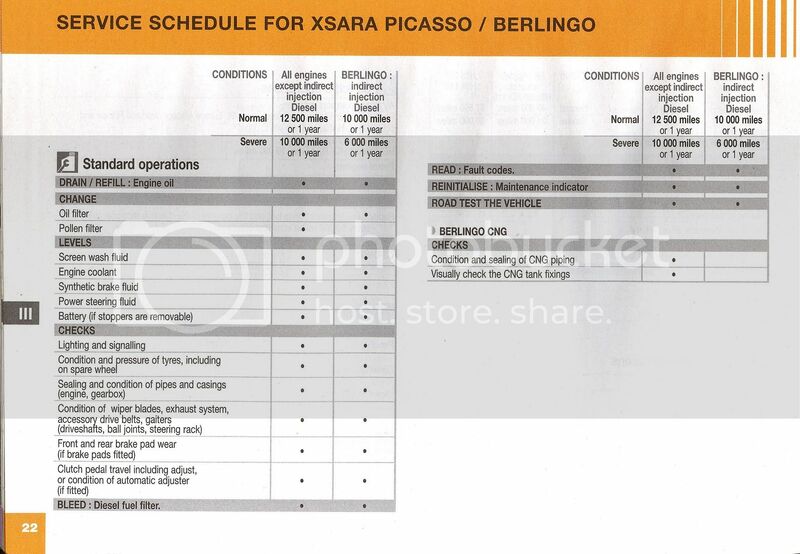 I hoped to get hold of a Citroen workshop service schedule job list, the sort with check boxes for each task and check completed as I have for my Mazda. I did get hold of the Citroen TIS software and there is a service section but with no documents within for the Berlingo. Does anyone know of such a document floating about? I will have a look/think and get back to you when i get home, i cannot think off the top of my head except for the new Haynes. I'm still keeping my eye open for a suitable service book which also shows the basic repair/replace jobs. Not too sure if the 'new' Haynes manual covers my particular model? The menu kindly provided by Northman is a help with the service side of things but, personally, I would like a manual that shows HOW the procedures are conducted (replace brake shoes/pads, filters etc.). Will let you all know if I locate anything. About as reliable as the rest of the info in them then! They are however OK for basic routine servicing. You thought that M59 died? You have M59 or B9?